In this week of the world spinning off into melt down; and fear and mistrust being the dominant emotions, let us create a wee pool of loveliness…. On Tuesday on the Facebook page a thread of fluffy kittens and heartwarming YouTube clips was started to bring a little light into the darkness, this has brought laughter and feel good goose bumps to many. On Wednesday this week, many Scottish Gals gathered in Edinburgh for a festive lunch and a time to catch up. We were celebrating a new call and a new job and an imminent wedding amongst other things, and it was a lovely, fun, noisy time! Indoor Place: have you got an oasis at home that you can hide away in? Outdoor Space: is it water, hills, woodland? Is it the fresh country air or the bustling city? Person: do you have a go to person, for when the world is crowding in? Music: being a music major there are lots of pieces of music from many genres that speak to my heart and stirs my inmost being or my soul. However,right now what I need most is, the reminder that God is always there no matter where I may find myself – emotionally, physically, geographically, and /or spiritually – the song would then be Always There by the Canadian Tenors. Perhaps not the best video but one can be found here. My indoor oasis: wish I could say it was my sewing room but it only seems to be a cluttered mess where everyone dumps things. So I would say my office. The space that’s mine, filled with things I want on the walls, a nifty cart from Ikea filled with coloring instruments, and of course the bed of my favorite 4 legged family member – Amos. Outdoor Space: any place with a water fall or the sound of water. Water moving is very soothing for me and I think very majestic. Picture: oh another tough one. I could choose so many. To play nice I won’t sit here and list or show all my favorites (but maybe a few). However at the top of the list is the set of 4 prints that a photographer took when my little man was just a month old. They are in black and white and have various amounts of me in them. They are all small and framed together – the first you can clearly see my face and my hands holding his head, the second you see just my black shirt and my cross necklace and a close up of him cuddled close but facing towards the camera, the third is a side view of both of us and he is so expressive as he turns his head towards the photographer, the last you can just see my smile and again I’m holding him outwards with my hands under his head. I can only imagine what I might have been saying to him but it clearly shows the bond that God placed between us – as child and adoptive mom. To top it off it’s almost 10 years ago, where oh where has that time gone? (I’d show you the picture but then it would be a copyright breech so you’ll just have to use your imagination). 4b. Second Picture: A mosaic in the form of a heart. This was given to me by a lady in the first congregation we served. I doubt she knew that 16 years later I would still cherish it — it reminds me of the fact that my heart is so broken at times, yet God can and will help mend it, molding it, glueing it back together all by the means of underserved yet granted grace, mercy, and unconditional love. 5. Person: I have different go to people in different settings. Or maybe I wouldn’t call them go to people in the terms of telling them what’s on my mind but people that help me be centered and know I’m safe, God usually provides that for me — and no words could describe my emotions, my fears when I don’t have that person. However, my always, always there for me person is my best friend. Never lived in the same town but always just a text, a call, an email, or even a Facebook post away. Some of you may have seen she was just named Dean of Faculty at Pittsburgh Theological School . We share a lot in common but most significant is our passion for better mental health awareness and care within our churches and the world around us. Wow, it’s hard to believe that it’s Friday again! But it is and that means its time once again to play Friday Five with my sisters over at RevGalBlogPals and our pals (either male or female). So here goes another round! Hey there gals and pals! 1. If you could hear what someone is thinking for a day, who would you choose, and why? 2. If you were trapped in a tv show for a month, which show would you choose, and why? 3. If you could do any job in the world for a day, what would it be? 4. What are you loving right now? 5. Use these words in a sentence: bless, cheeseburger, chihauuaha, skipping, Georgia. Have fun, and let us know that you played in the comments! 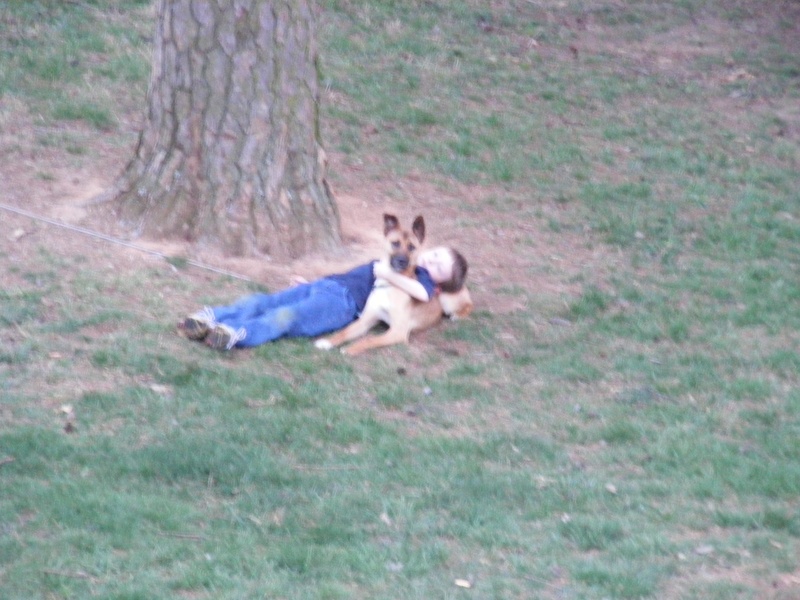 A little boy and his dog! Well when my littleman was a baby I used to wonder what he’s thinking. As he’s gotten older and sometimes I wonder if he will ever be quiet, I still think I would choose him. I wonder what things he says when he and our dog are laying out in the yard together. (And as a side, he really wanted a certain breed as mentioned in #5 but instead we got a mutt and he’s loved a lot)! I wonder what goes on in his mind or what doesn’t when he becomes distracted at school and when he uses animal sounds to cover his anxiety. I wonder what goes on in his little but ever changing mind – I wonder if I could read his mind how might I be a better mom to him. 2. If you were trapped in a tv show for a month, which show would you choose, and why? I often watch Untold Stories of the ER and each time I wonder, why don’t they have a chaplain or I find myself saying to the doctor at the center of the incident, why don’t you also consult a chaplain or that persons pastor (or faith leader). So if I were able to caught in the show I could speak that thought and maybe help build a bridge between the medical world and the spiritual world. 3. If you could do any job in the world for a day, what would it be? I’ve spent a LOT of time at a local Apple Store this week and if one thing I learnt is that there are am incredible amount of interesting people who come and go from an Apple Store. Not to mention a staff that never seems to tire of smiling and being with each other. I’d like to work at an Apple Store for a day….oh wait maybe not because I wouldn’t take home a penny of pay and would end up coming home with absolutely no money (in fact likely a lot less than I began my day with). 4. What are you loving right now? Gluten Free Fridays at my local Gigi’s Cupcakes and a group of girl friends to enjoy them with! 5. Use these words in a sentence: bless, cheeseburger, chihuahua, skipping, Georgia. A littleman born in Georgia bless(es) my life with his love of cheeseburgers, chihuahuas and his ability to skip through life! Ok so I stretched number five by Sayers blesses instead of simply bless but it’s all I had at 1:00 am. Until next time my friends may The Lord continue to bless you!